BNNT is no ordinary band. It's an experiment. An uncompromising duo: no shirts, just balaclavas. Extreme audio-visual sensations guaranteed. Konrad Smoleński and Daniel Szwed. An audioperformative project. An audiovisual installation. A loud, hypnotizing situation. Representatives of the independent label Instant Classic, for whom they have recently recorded the acclaimed "Multiverse" album. 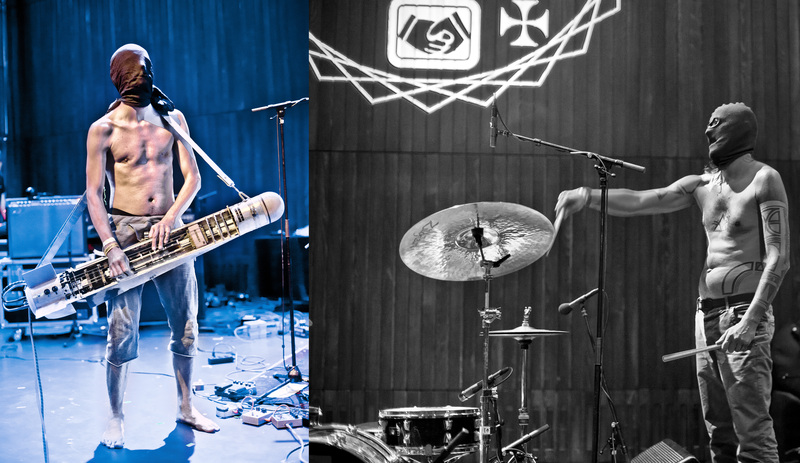 Stop by Muzeum Sztuki Saturday evening and find out just how intense can two instruments be. Especially when one is a drum kit, and the other a self made baritone missile guitar. Have you ever seen a missile guitar? Have you heard one? BNNT will perform on the courtyard of Muzeum Sztuki ms1 in correlation with opening our new Study Warehouse. The project to rebuild the J building is funded by the Operational Programme Infrastructure and Environment for the years 2014-2020 and the European Regional Development Fund. The project also received funding from the Marshal Office of Lodz.